ZIVE SM, Smart Manager is to control ZIVE SP/MP/ED model. It provides user defined test sequence using sequence file,technique menu and batch file which serial test using sequence files and/or technique files. This software is easy to use and functions which support various electrochemical experiments including functions of system control, schedule file editor, real time graph, analysis graph, user calibration, data file treatment etc. The above functions can be used sequentially by step control function. 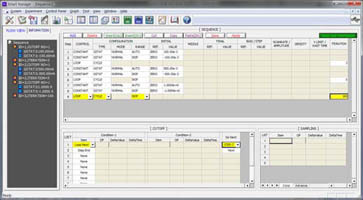 User can design his/her experiment procedure using TASK sequential routine editor. User can design batch file including multiple technique files and/or sequence files. With this batch file, user can do experiments as several techniques /sequence in series automatically. Other application software package can be added by option. For a wide range of application, specific experimental technique software packages are provided as option. *1. The system measures open circuit potential before for each frequency change and apply AC sine wave on this potential. Pulse mode is available for GSM & CDMA profile. Pulse shape profile can be measured by user¡¯s demand. Pulse shape profile monitor (micro seconds order). Time, voltage, current, power, temperature, AuxV etc. Various battery charge/discharge test is available including pulse discharge for GSM, CDMA application. Each software package's upgrade will be provided at free of charge. data in VOI(value of interest) window and channel status in one window. Real time graph¡¯s X Y axis format will be changed per techniques automatically. It can be defined by user's demand per techniques. For experiment using sequence file or batch file, user can select 3 real time graph's X, Y axis parameter. form monitor will be displayed on real time graph to check wave quality. This monitor can be switched to Lissajous (I vs. E) plot. Graph. Smart Manager's graph function is to simplify the operation. There are 3 kinds of graph per experiments. You can change X, Y1, Y2, Y3, Y4 axis parameter as you want. Each graph provides short buttons. When you click these buttons, graph format will be changed following short button format. Short button for I vs. V, E vs. LogI, V, I vs. time are provided. Short button for Nyquist plot and Bode plot are provided. Short button for cycle capacity and cycle average plot are provided.